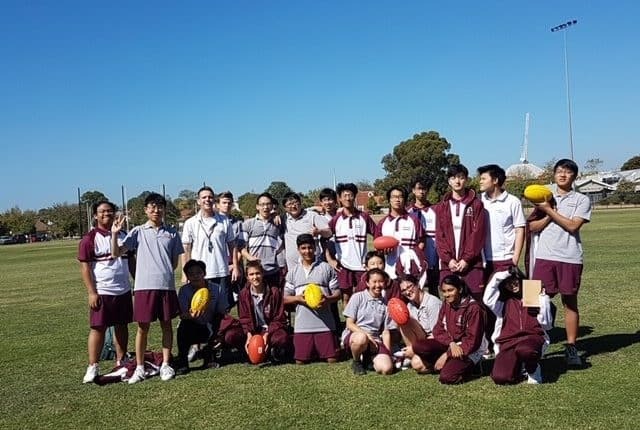 Our senior physical activity group comprising mostly of our Chinese international students, were treated to a masterclass lesson in Australian Rules Footy, by none other than our dashing head of PE Mr Wengier. Mr Wengier is a die hard Collingwood supporter (and he still has most of his teeth), who tried convincing our Chinese students that it is compulsory to support Collingwood. While some students were struggling to understand the rules of this unique Australian game, they all quickly got the hang of it and we had a great afternoon playing a big game of jack in the pack. Well done to Mr Wengier. Football was the winner!